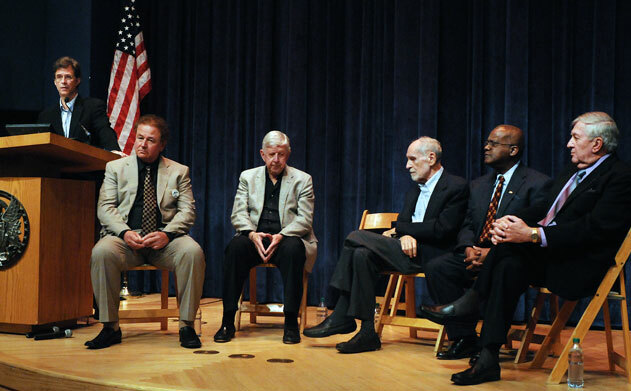 At Georgetown University on October 18, 2011, I (standing at left) led a discussion with a distinguished panel of people whose interviews helped shape my book. Seated from left are: Jim Stakem, strike leader at Washington Air Route Traffic Control Center (Washington Center) in 1981; Ken Moffett, Reagan-era director of the Federal Mediation and Conciliation Service who mediated the failed 1981 negotiations; Stan Gordon, who helped organize PATCO at New York Center in Islip, New York, in 1968; Richard Jones, formerly of Washington Center, who co-founded the Coalition of Black Controllers but did not participate in the 1981 strike; and John Leyden, who served as president of PATCO from 1970 to 1980. 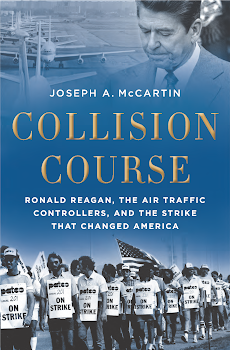 We had a fascinating exchange regarding the strike and its long-term impact on both the controllers who lost their jobs in 1981 and on patterns of U.S. labor relations since. For more on that event, click here.